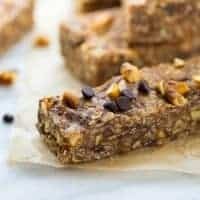 No-Bake, healthy Peanut Butter Pretzel Bars! Honey-sweetened and so easy to make. These no-bake peanut butter pretzel bars are honey-sweetened and really easy to make! They are the perfect recipe to have for the warmer months ahead. I love healthy treats like this when my kids and I want an afternoon snack. Check out the video below to see how easy they are to make! 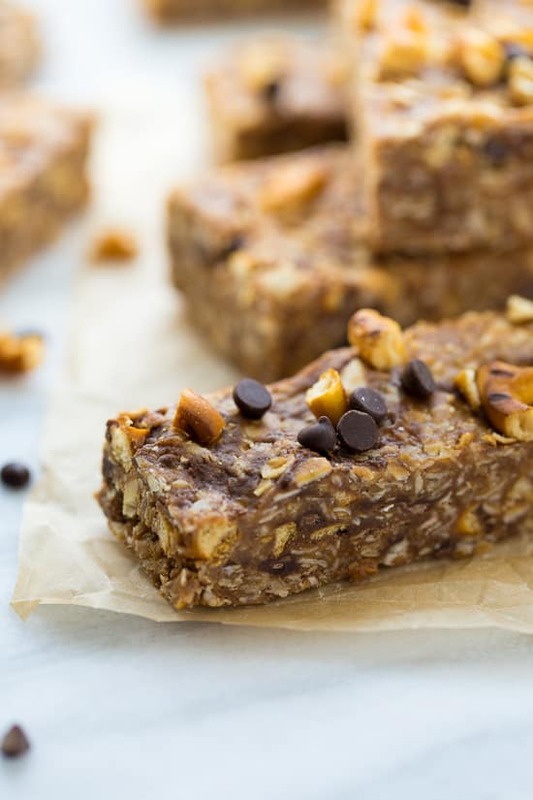 I use gluten-free pretzels and oats to keep these bars gluten-free. 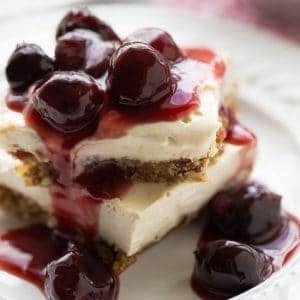 These are my family’s very favorite no-bake treat. The little bites of salty pretzel really make the bars. And peanut butter/chocolate is always a winning combination! Sometimes the key to staying on a special diet successfully is to be able to have a treat ever once and awhile. These bars freeze great, so you can keep a stash in your freezer for times when you need a little sweetness. 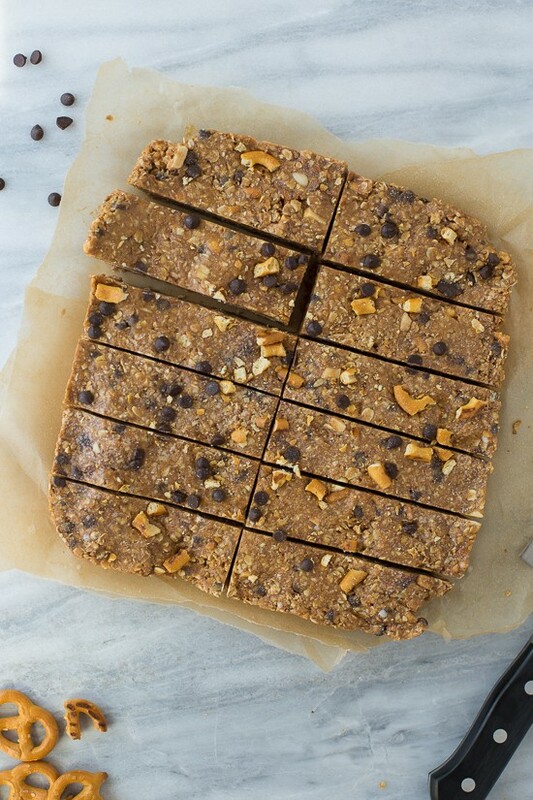 These bars work great with sunflower seed butter or almond butter if you prefer. 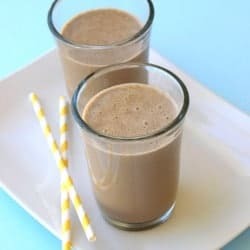 If you don’t have quick oats (these are my favorite gluten-free quick oats), try pulsing regular gluten-free oats in the blender or food processor to use in this recipe. Enjoy! Line an 8×8 or a 9×9 pan with parchment paper. Place the crushed pretzels, oats, almonds, chocolate chips, salt and vanilla in a bowl and stir to combine. Whisk together the peanut butter and honey. You may need to heat the mixture in the microwave or stove top slightly to get it smooth and combined. Add the peanut butter mixture to the oat mixture and stir to thoroughly combine. Press the mixture into the prepared pan and top with more crushed pretzels or chocolate chips is you like. Chill for 1 hour before slicing. Cut into bars. Store in an airtight container at room temperature or in the fridge for longer storage. Enjoy! These 4-Ingredient No-Bake Peanut Butter Oatmeal Cookies from Beaming Baker would make another delicious gluten-free peanut butter treat! There is nothing better than a delicious no bake snack. These look perfect for throwing in my bag on the go. YUM! You had me at peanut butter! So funny, when I first saw the title of your post I was thinking “Oooh, I’ll bet I could make GF version” but you did all the work for me! They look awesome and I’m definitely making some this weekend. Yay for GF! I hope you like them! 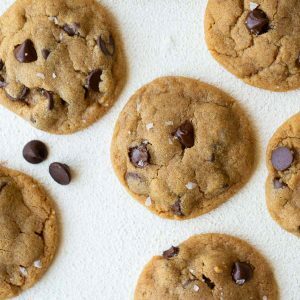 Made these the other night and must have put a bit too much on my dry ingredients because after everything cooled they kind of fall apart when you eat them, but the flavor is unbelievably DELICIOUS!! I will make them again, as soon as we get this first batch eaten. I will just make sure they are “wet” enough this time. Thanks for another great recipe.Love that they are quick, easy, and portable. I’m glad you like the flavor! I hope they turn out better next time. This recipe works best with liquid-y honey and no-stir peanut butter. I hope that helps! Definitely! 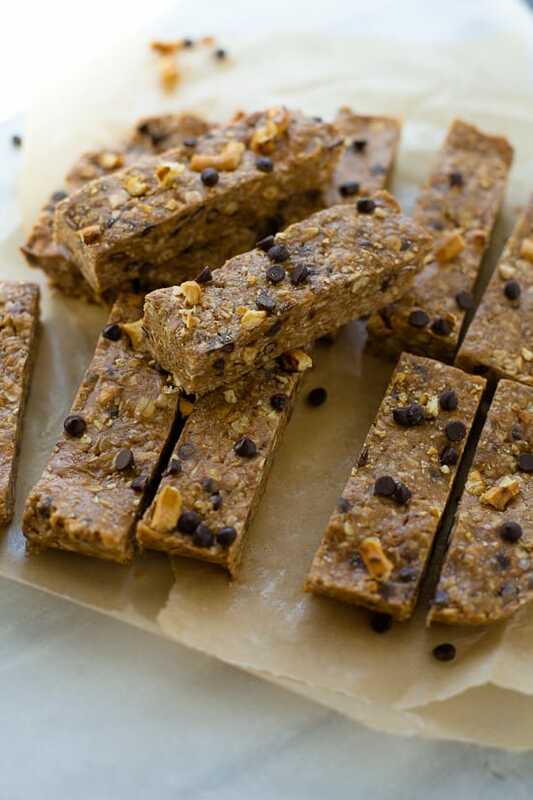 These work great with almond butter or sunflower seed butter! Love your Blog! Thank you for all of your wonderful recipes to help others eat better. I made these with Justin’s Hazelnut chocolate and Raw honey. Reminded me of a chocolate no bake cookie with a salted crunch. Yummy! Thanks Dorthy! I’m glad you liked them! Any chance u could do nutritional facts? If one wanted to make these vegan , would maple syrup work in place of the honey ? These are freaking amazing! Made them tonight and just waiting for them to finish chilling, but couldn’t help myself but to taste it before its finished chilling and OMG these are freaking amazing!